Economists are expecting the first quarter contraction in the economy to be followed by a strong second quarter as that has been the pattern of the past two years. The 2.2% seasonally adjusted annualised quarter-on-quarter (q/q) contraction in the first quarter 2018 was the largest q/q decline since the 6.1% drop in the first quarter 2009. “While today’s print is certainly disappointing and suggests that full year growth may have to be downwardly revised, we are reluctant to do so for now, for two primary reasons,” First National Bank Senior Economic Analyst Jason Muscat said in his reaction note. 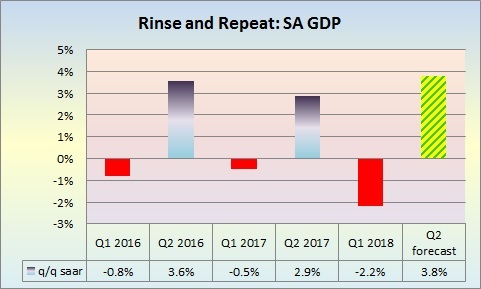 “Firstly, as we have mentioned before, the South African economy is not unfamiliar with a poor first quarter GDP number, and has indeed bounced back in the past. Secondly, there were no revisions to the historical data which suggests that this number could well be revised higher in future GDP releases, and GDP revisions have typically been upward, as opposed to lower,” he wrote. “I am glad that the contraction came in worse than my expectation of a 1.6% drop, as that means we are very unlikely to see another contraction in the current quarter, so we will not have a recession this year as that requires two consecutive quarters of contraction,” Efficient Group chief economist Dawie Roodt said. The contraction was broad-based with seven out of eleven sectors having quarterly contractions. The four sectors showing an expansion were transport, financial services, government services and personal services. Agriculture, mining and manufacturing were the main contributors to the contraction, while electricity, construction, internal trade and taxes were also subtractors. Following the recovery from the 2016 drought with a record maize harvest in 2017, agriculture lost ground in the first quarter as it contracted by 24.2% for the largest quarter-on-quarter seasonally adjusted annualised decline since the second quarter 2006. On a year ago basis, agriculture fell by 8.5% after a 17.7% gain in 2017. Mining entered into a technical recession with its second consecutive quarter of contraction as a 9.9% quarterly decline followed a 4.4% drop in the fourth quarter. Lower production in gold, platinum group metals and iron ore were the main reasons for the contraction. On a year ago basis, mining dipped by 0.7% after a 4.6% rise in 2017. Given the drop in the above primary sectors it was no wonder that manufacturing, which processes the products of the primary sector, also had a contraction. The quarterly drop was 6.4%. The decline was driven largely by a fall in production of petroleum and chemical products, as well as basic iron and steel. On a year ago basis, manufacturing grew by 0.7% after a 0.2% dip in 2017. Internal trade activity had a 3.1% quarterly contraction, on the back of weaker wholesale, retail and motor trade sales and lower activity in catering and accommodation, after a very strong fourth quarter, when growth was 4.8%. On a year ago basis, trade expanded by 0.7% after a 0.6% contraction in 2017. The construction industry experienced its fifth consecutive quarter of decline with a 1.9% decrease. On a year ago basis, construction contracted by 0.7% after a 0.3% decline in 2017. “We have long maintained that the domestic growth impetus will begin rotating from the primary sector toward the tertiary sector, and while the weakness from the primary and secondary sectors were largely anticipated, the real disappointment came from the trade, catering and accommodation industry, suggesting that household consumption momentum is yet to take hold,” Muscat said. From an expenditure point of view, domestic economic activity remained expansionary, albeit substantially less robust than in the fourth quarter. It grew by 0.6% quarter-on-quarter seasonally adjusted annualised compared with a 6.8% surge in the fourth quarter. The contraction in the primary sector and in manufacturing however meant that exports contracted, so net exports subtracted 3.1 percentage points from the total expenditure change, resulting in a 2.5% contraction in the first quarter after a 3.1% expansion in the fourth quarter. “Importantly, private sector fixed investment remains weak, falling by 2.7%, which likely speaks to uncertainty hanging over policy implementation, mining, independent power, minimum wage and land expropriation in particular. As some of this uncertainty has since dissipated, we would expect investment to pick up in the next reading,” Muscat noted. His comments on private sector fixed investment were echoed by John Ashbourne the Senior Emerging Markets Economist at Capital Economics in London. “The most worrying result was the fall in investment. Ending the persistent weakness of investment spending is a necessary step if South Africa is to achieve sustained growth,” Ashbourne said.